Cardiac muscle contracts in a similar manner to skeletal muscle, although with some important differences. An electrical stimulation in the form of an action potential triggers the release of calcium from the cell's internal calcium store, the sarcoplasmic reticulum. The rise in calcium causes the cell's myofilaments to slide past each other in a process called excitation contraction coupling. Contracting heart muscle uses a lot of energy, and therefore requires a constant flow of blood to provide oxygen and nutrients. Blood is brought to the myocardium by the coronary arteries. These originate from the aortic root and lie on the outer or epicardial surface of the heart. Blood is then drained away by the coronary veins into the right atrium. When looked at microscopically, cardiac muscle can be likened to the wall of a house. Most of the wall is taken up by bricks, which in cardiac muscle are individual cardiac muscle cells or cardiomyocytes. The mortar which surrounds the bricks is known as the extracellular matrix, produced by supporting cells known as fibroblasts. In the same way that the walls of a house contain electrical wires and plumbing, cardiac muscle also contains specialised cells for conducting electrical signals rapidly (the cardiac conduction system), and blood vessels to bring nutrients to the muscle cells and take away waste products (the coronary arteries, veins and capillary network). Cardiac muscle cells or cardiomyocytes are the contracting cells which allow the heart to pump. Each cardiomyocyte needs to contract in coordination with its neighbouring cells to efficiently pump blood from the heart, and if this coordination breaks down then – despite individual cells contracting – the heart may not pump at all, such as may occur during abnormal heart rhythms such as ventricular fibrillation. Viewed through a microscope, cardiac muscle cells are roughly rectangular, measuring 100–150μm by 30–40μm. Individual cardiac muscle cells are joined together at their ends by intercalated disks to form long fibres. Each cell contains myofibrils, specialised protein fibres that slide past each other. These are organised into sarcomeres, the fundamental contractile units of muscle cells. The regular organisation of myofibrils into sarcomeres gives cardiac muscle cells a striped or striated appearance when looked at through a microscope, similar to skeletal muscle. These striations are caused by lighter I bands composed mainly of a protein called actin, and darker A bands composed mainly of myosin. Cardiomyocytes contain T-tubules, pouches of membrane that run from the surface to the cell's interior which help to which improve the efficiency of contraction. The majority of these cells contain only one nucleus (although they may have as many as four), unlike skeletal muscle cells which typically contain many nuclei. Cardiac muscle cells contain many mitochondria which provide the energy needed for the cell in the form of adenosine triphosphate (ATP), making them highly resistant to fatigue. T-tubules are microscopic tubes that run from the cell surface to deep within the cell. They are continuous with the cell membrane, are composed of the same phospholipid bilayer, and are open at the cell surface to the extracellular fluid that surrounds the cell. T-tubules in cardiac muscle are bigger and wider than those in skeletal muscle, but fewer in number. In the centre of the cell they join together, running into and along the cell as a transverse-axial network. Inside the cell they lie close to the cell's internal calcium store, the sarcoplasmic reticulum. Here, a single tubule pairs with part of the sarcoplasmic reticulum called a terminal cisterna in a combination known as a diad. The functions of T-tubules include rapidly transmitting electrical impulses known as action potentials from the cell surface to the cell's core, and helping to regulate the concentration of calcium within the cell in a process known as excitation-contraction coupling. The cardiac syncytium is a network of cardiomyocytes connected to each other by intercalated discs that enable the rapid transmission of electrical impulses through the network, enabling the syncytium to act in a coordinated contraction of the myocardium. There is an atrial syncytium and a ventricular syncytium that are connected by cardiac connection fibres. Electrical resistance through intercalated discs is very low, thus allowing free diffusion of ions. The ease of ion movement along cardiac muscle fibers axes is such that action potentials are able to travel from one cardiac muscle cell to the next, facing only slight resistance. Each syncytium obeys the all or none law. Intercalated discs are complex adhering structures that connect the single cardiomyocytes to an electrochemical syncytium (in contrast to the skeletal muscle, which becomes a multicellular syncytium during mammalian embryonic development). The discs are responsible mainly for force transmission during muscle contraction. Intercalated discs consist of three different types of cell-cell junctions: the actin filament anchoring adherens junctions, the intermediate filament anchoring desmosomes, and gap junctions. They allow action potentials to spread between cardiac cells by permitting the passage of ions between cells, producing depolarization of the heart muscle. However, novel molecular biological and comprehensive studies unequivocally showed that intercalated discs consist for the most part of mixed-type adhering junctions named area composita (pl. areae compositae) representing an amalgamation of typical desmosomal and fascia adhaerens proteins (in contrast to various epithelia). The authors discuss the high importance of these findings for the understanding of inherited cardiomyopathies (such as arrhythmogenic right ventricular cardiomyopathy). Under light microscopy, intercalated discs appear as thin, typically dark-staining lines dividing adjacent cardiac muscle cells. The intercalated discs run perpendicular to the direction of muscle fibers. Under electron microscopy, an intercalated disc's path appears more complex. At low magnification, this may appear as a convoluted electron dense structure overlying the location of the obscured Z-line. At high magnification, the intercalated disc's path appears even more convoluted, with both longitudinal and transverse areas appearing in longitudinal section. Cardiac fibroblasts are vital supporting cells within cardiac muscle. They are unable to provide forceful contractions like cardiomyocytes, but instead are largely responsible for creating and maintaining the extracellular matrix which forms the mortar in which cardiomyocyte bricks are embedded. Fibroblasts play a crucial role in responding to injury, such as a myocardial infarction. Following injury, fibroblasts can become activated and turn into myofibroblasts – cells which exhibit behaviour somewhere between a fibroblast (generating extracellular matrix) and a smooth muscle cell (ability to contract). In this capacity, fibroblasts can repair an injury by creating collagen while gently contracting to pull the edges of the injured area together. Fibroblasts are smaller but more numerous than cardiomyocytes, and several fibroblasts can be attached to a cardiomyocyte at once. When attached to a cardiomyocyte they can influence the electrical currents passing across the muscle cell's surface membrane, and in the context are referred to as being electrically coupled. Other potential roles for fibroblasts include electrical insulation of the cardiac conduction system, and the ability to transform into other cell types including cardiomyocytes and adipocytes. Continuing the analogy of heart muscle as being like a wall, the extracellular matrix is the mortar which surrounds the cardiomyocyte and fibroblasts bricks. The matrix is composed of proteins such as collagen and elastin along with polysaccharides (sugar chains) known as glycosaminoglycans. Together, these substances give support and strength to the muscle cells, create elasticity in cardiac muscle, and keep the muscle cells hydrated by binding water molecules. The matrix in immediate contact with the muscle cells is referred to as the basement membrane, mainly composed of type IV collagen and laminin. Cardiomyocytes are linked to the basement membrane via specialised glycoproteins called integrins. The physiology of cardiac muscle shares many similarities with that of skeletal muscle. The primary function of both muscle types is to contract, and in both cases a contraction begins with a characteristic flow of ions across the cell membrane known as an action potential. The action potential subsequently triggers muscle contraction by increasing the concentration of calcium within the cytosol. However, the mechanism by which calcium concentrations within the cytosol rise differ between skeletal and cardiac muscle. In cardiac muscle, the action potential comprises an inward flow of both sodium and calcium ions. The flow of sodium ions is rapid but very short-lived, while the flow of calcium is sustained and gives the plateau phase characteristic of cardiac muscle action potentials. The comparatively small flow of calcium through the L-type calcium channels triggers a much larger release of calcium from the sarcoplasmic reticulum in a phenomenon known as calcium-induced calcium release. In contrast, in skeletal muscle, minimal calcium flows into the cell during action potential and instead the sarcoplasmic reticulum in these cells is directly coupled to the surface membrane. This difference can be illustrated by the observation that cardiac muscle fibres require calcium to be present in the solution surrounding the cell in order to contract, while skeletal muscle fibres will contract without extracellular calcium. During contraction of a cardiac muscle cell, the long protein myofilaments oriented along the length of the slide over each other in what is known as the sliding filament hypothesis. There are two kinds of myofilaments, thick filaments composed of the protein myosin, and thin filaments composed of the proteins actin, troponin and tropomyosin. As the thick and thin filaments slide past each other the cell becomes shorter and fatter. In a mechanism known as crossbridge cycling, calcium ions bind to the protein troponin, which along with tropomyosin then uncover key binding sites on actin. Myosin, in the thick filament, can then bind to actin, pulling the thick filaments along the thin filaments. When the concentration of calcium within the cell falls, troponin and tropomyosin once again cover the binding sites on actin, causing the cell to relax. Until recently, it was commonly believed that cardiac muscle cells could not be regenerated. However, a study reported in the April 3, 2009 issue of Science contradicts that belief. Olaf Bergmann and his colleagues at the Karolinska Institute in Stockholm tested samples of heart muscle from people born before 1955 who had very little cardiac muscle around their heart, many showing with disabilities from this abnormality. By using DNA samples from many hearts, the researchers estimated that a 4-year-old renews about 20% of heart muscle cells per year, and about 69 percent of the heart muscle cells of a 50-year-old were generated after he or she was born. One way that cardiomyocyte regeneration occurs is through the division of pre-existing cardiomyocytes during the normal aging process. The division process of pre-existing cardiomyocytes has also been shown to increase in areas adjacent to sites of myocardial injury. In addition, certain growth factors promote the self-renewal of endogenous cardiomyocytes and cardiac stem cells. For example, insulin-like growth factor 1, hepatocyte growth factor, and high-mobility group protein B1 increase cardiac stem cell migration to the affected area, as well as the proliferation and survival of these cells. Some members of the fibroblast growth factor family also induce cell-cycle re-entry of small cardiomyocytes. Vascular endothelial growth factor also plays an important role in the recruitment of native cardiac cells to an infarct site in addition to its angiogenic effect. Based on the natural role of stem cells in cardiomyocyte regeneration, researchers and clinicians are increasingly interested in using these cells to induce regeneration of damaged tissue. Various stem cell lineages have been shown to be able to differentiate into cardiomyocytes, including bone marrow stem cells. For example, in one study, researchers transplanted bone marrow cells, which included a population of stem cells, adjacent to an infarct site in a mouse model. Nine days after surgery, the researchers found a new band of regenerating myocardium. 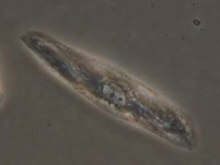 However, this regeneration was not observed when the injected population of cells was devoid of stem cells, which strongly suggests that it was the stem cell population that contributed to the myocardium regeneration. Other clinical trials have shown that autologous bone marrow cell transplants delivered via the infarct-related artery decreases the infarct area compared to patients not given the cell therapy. Cardiac muscle forms both the atria and the ventricles of the heart. 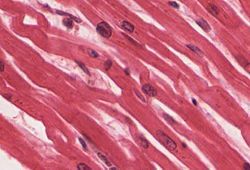 Although this muscle tissue is very similar between cardiac chambers, some differences exist. The myocardium found in the ventricles is thick to allow forceful contractions, while the myocardium in the atria is much thinner. The individual myocytes that make up the myocardium also differ between cardiac chambers. Ventricular cardiomyocytes are longer and wider, with a denser T-tubule network. Although the fundamental mechanisms of calcium handling are similar between ventricular and atrial cardiomyocytes, the calcium transient is smaller and decays more rapidly in atrial myocytes, with a corresponding increase in calcium buffering capacity. The complement of ion channels differs between chambers, leading to longer action potential durations and effective refractory periods in the ventricles. Certain ion currents such as IK(UR) are highly specific to atrial cardiomyocytes, making them a potential target for treatments for atrial fibrillation. Diseases affecting cardiac muscle are of immense clinical significance, and are the leading cause of death in developed nations. The most common condition affecting cardiac muscle is ischaemic heart disease, in which the blood supply to the heart is reduced. In ischaemic heart disease, the coronary arteries become narrowed by atherosclerosis. If these narrowings gradually become severe enough to partially restrict blood flow, the syndrome of angina pectoris may occur. This typically causes chest pain during exertion that is relieved by rest. If a coronary artery suddenly becomes very narrowed or completed blocked, interrupting or severely reducing blood flow through the vessel, a myocardial infarction or heart attack occurs. If the blockage is not relieved promptly by medication, percutaneous coronary intervention, or surgery, then a region of heart muscle may become permanently scarred and damaged. Heart muscle can also become damaged despite a normal blood supply. The heart muscle may become inflamed in a condition called myocarditis, most commonly caused by a viral infection but sometimes caused by the body's own immune system. Heart muscle can also be damaged by drugs such as alcohol, long standing high blood pressure or hypertension, or persistent abnormal heart racing. Specific diseases of heart muscle called cardiomyopathies can cause heart muscle to become abnormally thick (hypertrophic cardiomyopathy), abnormally large (dilated cardiomyopathy), or abnormally stiff (restrictive cardiomyopathy). Some of these conditions are caused by genetic mutations and can be inherited. Many of these conditions, if severe enough, can damage the heart so much that the pumping function of the heart is reduced. If the heart is no longer able to pump enough blood to meet the body's needs, this is described as heart failure. 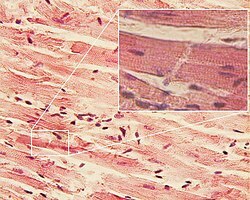 Wikimedia Commons has media related to Cardiac muscle. ^ a b S., Sinnatamby, Chummy (2006). Last's anatomy : regional and applied. Last, R. J. (Raymond Jack). (11th ed.). Edinburgh: Elsevier/Churchill Livingstone. ISBN 978-0-443-10032-1. OCLC 61692701. ^ Stöhr, Eric J.; Shave, Rob E.; Baggish, Aaron L.; Weiner, Rory B. (2016-09-01). "Left ventricular twist mechanics in the context of normal physiology and cardiovascular disease: a review of studies using speckle tracking echocardiography". American Journal of Physiology. Heart and Circulatory Physiology. 311 (3): H633–644. doi:10.1152/ajpheart.00104.2016. hdl:10369/9408. ISSN 1522-1539. PMID 27402663. ^ a b c d e (Pathologist), Stevens, Alan (1997). Human histology. Lowe, J. S. (James Steven), Stevens, Alan (Pathologist). (2nd ed.). London: Mosby. ISBN 978-0723424857. OCLC 35652355. ^ a b c d M., Bers, D. (2001). Excitation-contraction coupling and cardiac contractile force (2nd ed.). Dordrecht: Kluwer Academic Publishers. ISBN 978-0792371588. OCLC 47659382. ^ Hong, TingTing; Shaw, Robin M. (January 2017). "Cardiac T-Tubule Microanatomy and Function". Physiological Reviews. 97 (1): 227–252. doi:10.1152/physrev.00037.2015. ISSN 1522-1210. PMC 6151489. PMID 27881552. ^ Jahangir Moini; Professor of Allied Health Everest University Indialantic Florida Jahangir Moini (4 April 2011). Anatomy and Physiology for Health Professionals. Jones & Bartlett Publishers. pp. 213–. ISBN 978-1-4496-3414-8. ^ Khurana (1 January 2005). Textbook Of Medical Physiology. Elsevier India. p. 247. ISBN 978-81-8147-850-4. ^ Franke WW, Borrmann CM, Grund C, Pieperhoff S (February 2006). "The area composita of adhering junctions connecting heart muscle cells of vertebrates. I. Molecular definition in intercalated disks of cardiomyocytes by immunoelectron microscopy of desmosomal proteins". Eur. J. Cell Biol. 85 (2): 69–82. doi:10.1016/j.ejcb.2005.11.003. PMID 16406610. ^ Goossens S, Janssens B, Bonné S, et al. (June 2007). "A unique and specific interaction between alphaT-catenin and plakophilin-2 in the area composita, the mixed-type junctional structure of cardiac intercalated discs". J. Cell Sci. 120 (Pt 12): 2126–36. doi:10.1242/jcs.004713. PMID 17535849. ^ Pieperhoff S, Barth M, Rickelt S, Franke WW (2010). Mahoney MG, Müller EJ, Koch PJ (eds.). "Desmosomes and Desmosomal Cadherin Function in Skin and Heart Diseases-Advancements in Basic and Clinical Research". Dermatol Res Pract. 2010: 1–3. doi:10.1155/2010/725647. PMC 2946574. PMID 20885972. ^ Histology image:22501loa from Vaughan, Deborah (2002). A Learning System in Histology: CD-ROM and Guide. Oxford University Press. ISBN 978-0195151732. ^ a b Ivey, Malina J.; Tallquist, Michelle D. (2016-10-25). "Defining the Cardiac Fibroblast". Circulation Journal: Official Journal of the Japanese Circulation Society. 80 (11): 2269–2276. doi:10.1253/circj.CJ-16-1003. ISSN 1347-4820. PMC 5588900. PMID 27746422. ^ Rohr, Stephan (June 2009). "Myofibroblasts in diseased hearts: new players in cardiac arrhythmias?". Heart Rhythm. 6 (6): 848–856. doi:10.1016/j.hrthm.2009.02.038. ISSN 1556-3871. PMID 19467515. ^ Horn, Margaux A.; Trafford, Andrew W. (April 2016). "Aging and the cardiac collagen matrix: Novel mediators of fibrotic remodelling". Journal of Molecular and Cellular Cardiology. 93: 175–185. doi:10.1016/j.yjmcc.2015.11.005. ISSN 1095-8584. PMC 4945757. PMID 26578393. ^ Bergmann O, Bhardwaj RD, Bernard S, et al. (April 2009). "Evidence for cardiomyocyte renewal in humans". Science. 324 (5923): 98–102. doi:10.1126/science.1164680. PMC 2991140. PMID 19342590. ^ Senyo SE, Steinhauser ML, Pizzimenti CL, Yang VK, Cai L, Wang M, Wu TD, Guerguin-Kern JL, Lechene CP, Lee RT (January 2013). "Mammalian heart renewal by pre-existing cardiomyocytes". Nature. 493 (7432): 433–6. doi:10.1038/nature11682. PMC 3548046. PMID 23222518. ^ Germani A, Di Rocco G, Limana F, Martelli F, Capogrossi MC (March 2007). "Molecular mechanisms of cardiomyocyte regenerate and therapeutic outlook". Trends Mol Med. 13 (3): 125–33. doi:10.1016/j.molmed.2007.01.002. PMID 17257896. ^ Orlic D, Kajstura J, Chimenti S, Jakoniuk I, Anderson SM, Li B, Pickel K, McKay R, Nadal-Ginard B, Bodine DM, Anversa P (April 2001). "Bone marrow cells regenerate infarcted myocardium". Nature. 410 (6829): 701–5. doi:10.1038/35070587. PMID 11287958. ^ Orlic D, Hill JM, Arai AE (December 2002). "Stem cells for myocardial regeneration". Circ Res. 91 (12): 1092–102. doi:10.1161/01.RES.0000046045.00846.B0. PMID 12480809. ^ Walden, A. P.; Dibb, K. M.; Trafford, A. W. (April 2009). "Differences in intracellular calcium homeostasis between atrial and ventricular myocytes". Journal of Molecular and Cellular Cardiology. 46 (4): 463–473. doi:10.1016/j.yjmcc.2008.11.003. ISSN 1095-8584. PMID 19059414. ^ Ravens, Ursula; Wettwer, Erich (2011-03-01). "Ultra-rapid delayed rectifier channels: molecular basis and therapeutic implications". Cardiovascular Research. 89 (4): 776–785. doi:10.1093/cvr/cvq398. ISSN 1755-3245. PMID 21159668. ^ Lozano, Rafael; Naghavi, Mohsen; Foreman, Kyle; Lim, Stephen; Shibuya, Kenji; Aboyans, Victor; Abraham, Jerry; Adair, Timothy; Aggarwal, Rakesh (2012-12-15). "Global and regional mortality from 235 causes of death for 20 age groups in 1990 and 2010: a systematic analysis for the Global Burden of Disease Study 2010". Lancet. 380 (9859): 2095–2128. doi:10.1016/S0140-6736(12)61728-0. ISSN 1474-547X. PMID 23245604. ^ Smith, Jennifer N.; Negrelli, Jenna M.; Manek, Megha B.; Hawes, Emily M.; Viera, Anthony J. (March 2015). "Diagnosis and management of acute coronary syndrome: an evidence-based update". Journal of the American Board of Family Medicine: JABFM. 28 (2): 283–293. doi:10.3122/jabfm.2015.02.140189. ISSN 1558-7118. PMID 25748771. ^ Roffi, Marco; Patrono, Carlo; Collet, Jean-Philippe; Mueller, Christian; Valgimigli, Marco; Andreotti, Felicita; Bax, Jeroen J.; Borger, Michael A.; Brotons, Carlos (2016-01-14). "2015 ESC Guidelines for the management of acute coronary syndromes in patients presenting without persistent ST-segment elevation: Task Force for the Management of Acute Coronary Syndromes in Patients Presenting without Persistent ST-Segment Elevation of the European Society of Cardiology (ESC)". European Heart Journal. 37 (3): 267–315. doi:10.1093/eurheartj/ehv320. ISSN 1522-9645. PMID 26320110. ^ Cooper, Leslie T. (2009-04-09). "Myocarditis". The New England Journal of Medicine. 360 (15): 1526–1538. doi:10.1056/NEJMra0800028. ISSN 1533-4406. PMC 5814110. PMID 19357408. ^ Rose, Noel R. (July 2016). "Viral myocarditis". Current Opinion in Rheumatology. 28 (4): 383–389. doi:10.1097/BOR.0000000000000303. ISSN 1531-6963. PMC 4948180. PMID 27166925. ^ Bracamonte-Baran, William; Čiháková, Daniela (2017). Cardiac Autoimmunity: Myocarditis. Advances in Experimental Medicine and Biology. 1003. pp. 187–221. doi:10.1007/978-3-319-57613-8_10. ISBN 978-3-319-57611-4. ISSN 0065-2598. PMC 5706653. PMID 28667560. ^ a b Ponikowski, Piotr; Voors, Adriaan A.; Anker, Stefan D.; Bueno, Héctor; Cleland, John G. F.; Coats, Andrew J. S.; Falk, Volkmar; González-Juanatey, José Ramón; Harjola, Veli-Pekka (August 2016). "2016 ESC Guidelines for the diagnosis and treatment of acute and chronic heart failure: The Task Force for the diagnosis and treatment of acute and chronic heart failure of the European Society of Cardiology (ESC). Developed with the special contribution of the Heart Failure Association (HFA) of the ESC". European Journal of Heart Failure. 18 (8): 891–975. doi:10.1002/ejhf.592. ISSN 1879-0844. PMID 27207191. ^ Liew, Alphonsus C.; Vassiliou, Vassilios S.; Cooper, Robert; Raphael, Claire E. (2017-12-12). "Hypertrophic Cardiomyopathy-Past, Present and Future". Journal of Clinical Medicine. 6 (12): 118. doi:10.3390/jcm6120118. ISSN 2077-0383. PMC 5742807. PMID 29231893. ^ Japp, Alan G.; Gulati, Ankur; Cook, Stuart A.; Cowie, Martin R.; Prasad, Sanjay K. (2016-06-28). "The Diagnosis and Evaluation of Dilated Cardiomyopathy". Journal of the American College of Cardiology. 67 (25): 2996–3010. doi:10.1016/j.jacc.2016.03.590. ISSN 1558-3597. PMID 27339497. ^ Garcia, Mario J. (2016-05-03). "Constrictive Pericarditis Versus Restrictive Cardiomyopathy?". Journal of the American College of Cardiology. 67 (17): 2061–2076. doi:10.1016/j.jacc.2016.01.076. ISSN 1558-3597. PMID 27126534. ^ Towbin, Jeffrey A. (2014). "Inherited cardiomyopathies". Circulation Journal: Official Journal of the Japanese Circulation Society. 78 (10): 2347–2356. doi:10.1253/circj.CJ-14-0893. ISSN 1347-4820. PMC 4467885. PMID 25186923.